Plastic kits from the Ukraine. Formerly UniModel. Unimodel absorbed Skif at one point but the Skif members have separated and have now started their own line circa 2008 under the name UM MT (Ukrainian Models Military Technics). T-26 Light Tank Ex-Skif kit, without the etched brass parts. New plastic parts to replace the etched parts. No longer in UM catalogue, but marketed by UMMT. Ex-Skif kit, without the etched brass parts. New plastic parts to replace the etched parts. OT-130 Flame Tank Ex-Skif kit, without the etched brass parts. New plastic parts to replace the etched parts. OT-133 Flame Tank Ex-Skif kit, without the etched brass parts. New plastic parts to replace the etched parts. BT-5 Light Tank Comes with hard plastic, link-and-length tracks, decals, and a small fret of photoetched parts. Very detailed kit. Artillery Tank D-38 No longer in UM catalogue, but marketed by UMMT. BT-7 (1937) Same hull kit as #310, but with the new, conical turret. BT-7 Artillery Turret Also called BT-7A. Same as #310, but with 76mm howitzer. RBT-5 Experimental version of the BT-5 with two large rockets mounted next to the turret. T-26-4 Artillery Tank No longer in UM catalogue, but marketed by UMMT. T-26 Twin Turret Light Tank Shares many parts with Skif T-26, but improved in many areas. GAZ AAA Truck No longer in UM catalogue, but marketed by UMMT. XT-26 Chemical Tank No longer in UM catalogue, but marketed by UMMT. OT-34/76 Flamethrower tank with cast turret. BT-2 Light Tank Early No longer in UM catalogue, but marketed by UMMT. 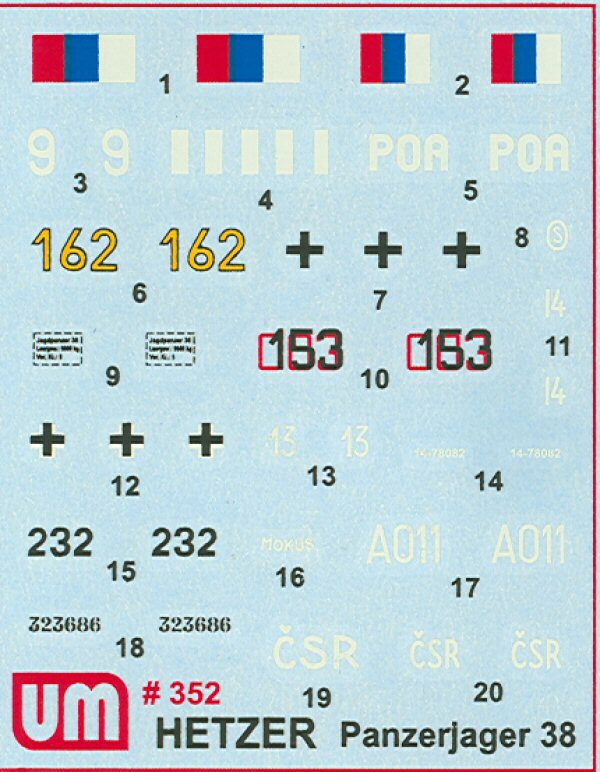 Decals 1, 2, 3, 4, and 5: this reference may give a better idea about how to use these decals. Decal 10 represents a vehicle with at least a late exhaust. The modeler will need to check references very, very carefully to identify the necessary parts. Decal 16 and 17 are for this vehicle, which has some early features. Decal 11 is for the captured vehicle. See below comment for Cybermodeler version of the decals. 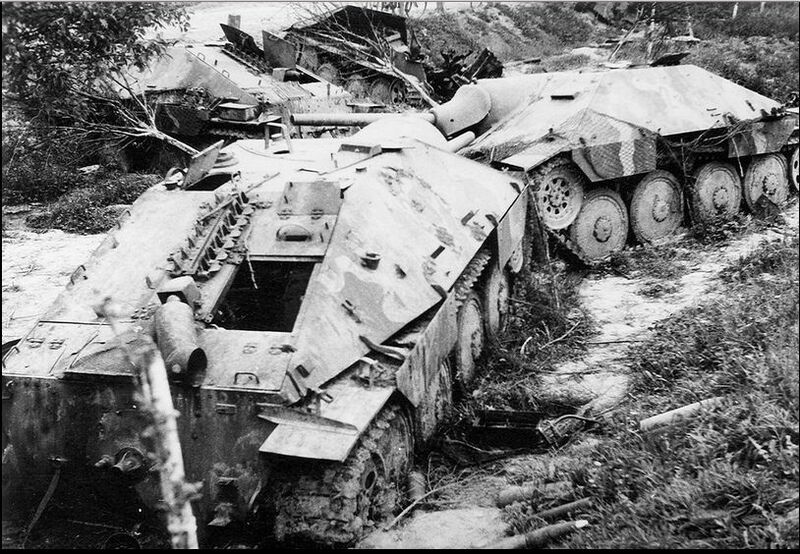 Decals 12 and 13 probably represent this vehicle, which is a late, not an early Hetzer. Decals 14, 15, and 16 are for "Chwat," an early Hetzer. Eduard's instructions for their 1/35 kit can be useful. Decal 17 might represent this vehicle. Decals 1, 3, 4: Eduard's instructions for their 1/35 kit can be useful. 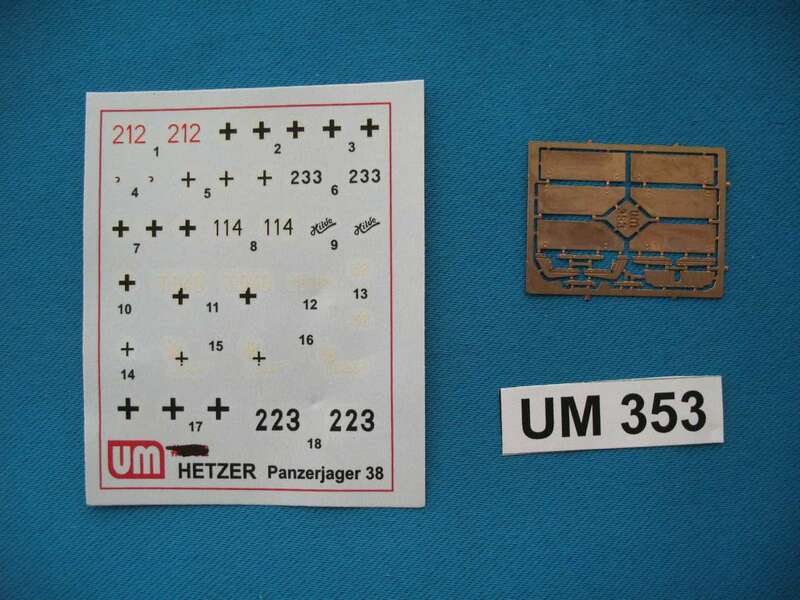 Decals 5 and 6: "233" is for a mid Hetzer, not for a late Hetzer. The kit has the parts to make the vehicle, but the builder should look for the proper mix of parts. 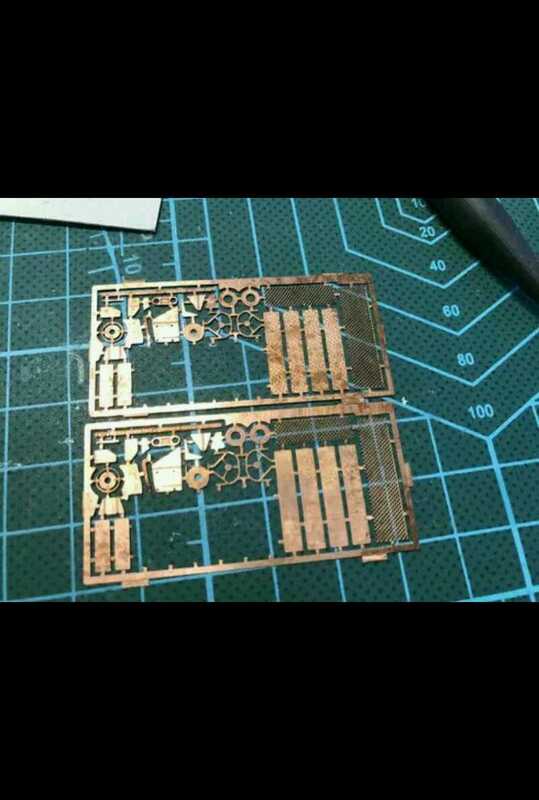 See Eduard kit instructions for the mid-production variant. Decals 7, 8, and 9: these decals are for 114, "Hilde," an early Hetzer. The builder needs to follow the instructions for the early kit. Also, refer to Eduard's instructions for the early version. Decals 11, 12, and 13: these represent Marika. "38" was a number added by the Soviets, so need to be omitted if the builder doesn't want a captured vehicle. Decals 14, 15, and 16: these decals are for "Chwat," an early Hetzer. They look the same as those in kit 352. The builder needs to follow the instructions for the early kit. Also, refer to Eduard's instructions for the early. T-26 w/Cylindrical Turret No longer in UM catalogue, but marketed by UMMT. T-34 Recovery Vehicle with SU-76 SPG Combo-kit. Tracks for T-26 No longer in UM catalogue, but marketed by UMMT. Christie T-3 Mod.1931/Mod.1940 No longer in UM catalogue, but marketed by UMMT. T-26-TN recon / T-26-T gun tractor No longer in UM catalogue, but marketed by UMMT. T-26 with BT-2 turret No longer in UM catalogue, but marketed by UMMT. BT-5 with RS-132 rocket launchers No longer in UM catalogue, but marketed by UMMT. 45mm gun 53-K (1937) & M-42 (1942) No longer in UM catalogue, but marketed by UMMT. T-26N & 45mm AT gun 53-K (1937) No longer in UM catalogue, but marketed by UMMT. 45mm gun 19-K (1932) & 76mm gun OB-25 (1943) No longer in UM catalogue, but marketed by UMMT. Armored railroad car OB-3 with T-26 (1933) turret No longer in UM catalogue, but marketed by UMMT. Armored Railroad Car OB-3 with T-26-1 (1937-9) turret No longer in UM catalogue, but marketed by UMMT. Armored locomotive OV of type OB-3 (No.5676) No longer in UM catalogue, but marketed by UMMT. OB-3 Armored Train Contains 1 Locomotive, 1 Tender, 4 Armored Railcars. OB-3 armored railway car with two T-26 turrets (1933) No longer in UM catalogue, but marketed by UMMT. Armored train OB-3 No.1 of the 23rd Battalion (without flat bed) No longer in UM catalogue, but marketed by UMMT. Biaxial 20ton platform No longer in UM catalogue, but marketed by UMMT. Two axle pilot car (long 9.2 meter) No longer in UM catalogue, but marketed by UMMT. Armored air defense railroad car No longer in UM catalogue, but marketed by UMMT. Vickers 6ton light tank model 'E' (version A) No longer in UM catalogue, but marketed by UMMT. Vickers 6ton light tank model 'E' (version B) No longer in UM catalogue, but marketed by UMMT. PL-43 Armored Rail Car with T-34/76 turret No longer in UM catalogue, but marketed by UMMT.